Employment - Nutri-Ject Systems, Inc.
Nutri-Ject Systems, Inc. is the leading bio-solids professionals in the Upper Midwest. 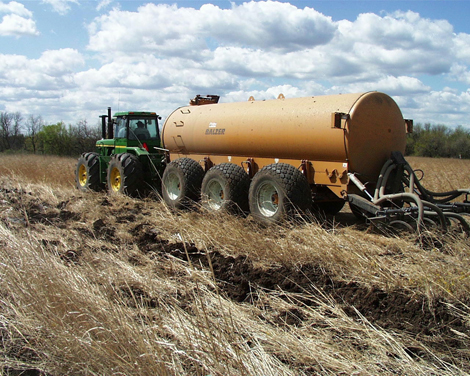 We specialize in removal and land application of solids from wastewater and water treatment facilities. Click Apply Now! to fill out an application. You can return it to us by fax: (319) 988-3506 or mail: 515 5th Street BOX 398, Hudson, IA 50643. If you have questions please call our human resource officer Jeff Welter at (319) 988-4205 or toll free (800) 798-4205. We are looking for laborers that are big-picture thinkers, problem solvers, and most importantly team players who can not only take instructions when needed; but also demonstrate initiative to perform tasks on their own. Individuals need to be detail oriented, mechanically adept, and ideally possess an agricultural background. Travel is required with the possibility of overtime. Rooms are paid for when travelling. We are looking for a big-picture thinker, problem solver, and a team player. Individual needs to be detail oriented with strong communication and leadership skills. This individual has the responsibility to keep production going by doing whatever it takes to get the job done in a timely manner. Basic computer programs, record keeping, and emails will be used on a regular basis. A background in equipment maintenance, agriculture, and employee management is preferred. Travel is required with the possibility of overtime. Rooms are paid for when travelling. Nutri-Ject Systems, Inc. is looking for a regional Class A driver with a tanker endorsement to pick up and deliver loads in a 4-state area. We are looking for a team player who is detail oriented with strong mechanical skills; equipment and agricultural background helpful. Travel is required with the possibility of overtime. Rooms are paid for when travelling.